The Cayenne S Hybrid is the greenest member of Porsche's new SUV range. MUNICH -- Porsche has released details of its new, greener Cayenne SUV that will debut at the Geneva auto show on March 2. The sports car maker says the Cayenne, which has hybrid and diesel versions, will offer improved fuel economy of up to 23 percent compared with the current model. Cayenne prices will start at 55,431 euros ($74,710) including taxes in Germany for the base model rising to 78,636 euros ($106,186) for the Cayenne S Hybrid and 115,526 euros ($156,000) for the Cayenne Turbo. The Cayenne S Hybrid is the most fuel-efficient version with CO2 emissions of 193 grams per kilometer and fuel economy of 8.2 liters per 100km (28.7 U.S. mpg). The Cayenne hybrid has a 3.0-liter supercharged V-6 that makes 333 hp and works with a 47-hp electric motor. It has a cruising feature, which the company is dubbing a "sailing" mode, that allows the combustion engine to be completely shut off at speeds of up to 156kph (97 mph) for cruising on electric power. The range of second-generation Cayennes is 48mm (1.9 inches) longer and has a wheelbase that is 40mm (1.6 inches) longer than the current model to expand interior space and functionality. Porsche says the new Cayenne is lighter, which helps reduced fuel consumption and CO2 emissions and improves performance, agility and handling. Lightweight materials such as a extra-light all-wheel-drive transmission have cut weight by 180kg (about 37 pounds) in the new Cayenne S compared with the previous generation. The new generation Porsche Cayenne will make its world debut at the Geneva Motor Show on March 2. Each model in the Cayenne range is a trend-setter in terms of efficiency and output and, compared with the former models, offers an increase in fuel economy of up to 23 per cent with more performance. The highlight of the new line-up is the technically sophisticated parallel full hybrid drive-train which combines the sporting performance of an eight-cylinder with the economy of a six-cylinder and a unique 'sailing mode' for even lower fuel consumption. The selection of materials for optimum weight combined with changes in the overall concept of the Cayenne - such as a new active and extra-light all-wheel drive transmission - has resulted in the overall weight of the Cayenne S, for example, being reduced by 180kg. This weight reduction clearly has a very positive effect not only on fuel consumption and CO2 emissions, but also on performance, agility, and handling. Consequently, the breadth of new features and new technologies throughout the Cayenne ensures that it offers greater driving quality both on- and off-road, together with enhanced safety and passenger comfort. The new Cayenne has been developed according to the principles of Porsche Intelligent Performance: more power on less fuel, greater efficiency and lower CO2 emissions. This philosophy is manifest in the introduction of a new Tiptronic S eight-speed automatic transmission featuring a wider spread of gear ratios, an Auto Start Stop function, optimised thermal management on the engine and transmission cooling system, on-board network recuperation, and intelligent lightweight construction. Overall, the new Cayenne is 48 mm longer than its predecessor. But despite its larger exterior dimensions, the design language of the new generation Cayenne represents a more compact and dynamic style. The fresh design of the new model integrates the 2010 Cayenne into the Porsche range and the sporting character of the Cayenne is clearly obvious, just as the highlights in the shape and design of the car so typical of Porsche are also clearly defined. Extra space inside and greater everyday usability is ensured by a 40mm longer wheelbase. The most significant feature within the brand new, high-quality interior is the rising centre console that extends to surround the gearshift selector and which gives the interior the typical Porsche 'cockpit' character. In the rear, the seat bench can move forwards and back by 160mm and the backrest angle has three different position settings. No less than three of the five versions of the new Cayenne consume less than ten litres of fuel per 100 km in the New European Driving Cycle, and two models emit fewer than 200 grams of CO2 per km. The Cayenne range starts with the 3.6-litre V6 petrol-engined Cayenne. Power has risen to 300 hp, but fuel consumption has dropped by a fifth - in conjunction with the eight-speed Tiptronic S automatic transmission - to 28.5 mpg Combined (9.9 ltr/100km) on the New European DrivingCycle. At 193 g/km, the Cayenne S Hybrid is not only the cleanest version of the Cayenne with the lowest level of emissions, but also the cleanest Porsche throughout the Company's entire portfolio. The Cayenne S Hybrid features a 333 hp drive-train that returns fuel consumption of 34.4mpg Combined (8.2 litres/100km) and CO2 emissions of 193 g/km. In the intelligent interaction of the 3.0-litre supercharged V6 and the electric motor, the Cayenne S Hybrid focuses on maximum efficiency from the overall powertrain system. Depending on driving conditions, the vehicle reaches this target with either only one drive unit operating independently or with both drive units working together. In this context the 34 kW (47 hp) electric motor is of course the ideal partner for the 333 hp compressor engine with its high torque at low speeds. Together, the two drive units deliver maximum output of 380 hp and peak torque of 580 Nm at just 1,000 rpm, with the same kind of performance as the Cayenne S with its conventional V8 petrol power unit. The two drive units are connected to one another by a separator clutch masterminded by the Hybrid Manager computer. This separator clutch is essential to run the Cayenne S Hybrid either on its electric motor or combustion engine alone, or with both drive units operating together. Thus, under relaxed driving conditions, for example in a residential area, this allows the driver to cover short distances on electric power alone and therefore absolutely free of emissions (and with hardly any noise). Furthermore, it is possible to drive in this mode at speeds of approaching 40 mph (60 km/h). However, to ensure fast acceleration when setting off, the electric motor may serve to provide additional thrust through its 'boosting' effect. Intelligent management of the separator clutch makes for an inconspicuous transition among the hybrid-specific driving modes, and one which is comfortable and quick for the driver. At the same time, the combustion engine may be completely switched off at speeds of up to 97 mph (156 km/h), being fully disengaged from the drivetrain when no further power is required. In this so-called 'sailing mode', cruising along without power, the drag forces exerted by the combustion engine and their braking effect are eliminated in the interest of lowering resistance and thus further benefitting fuel consumption. 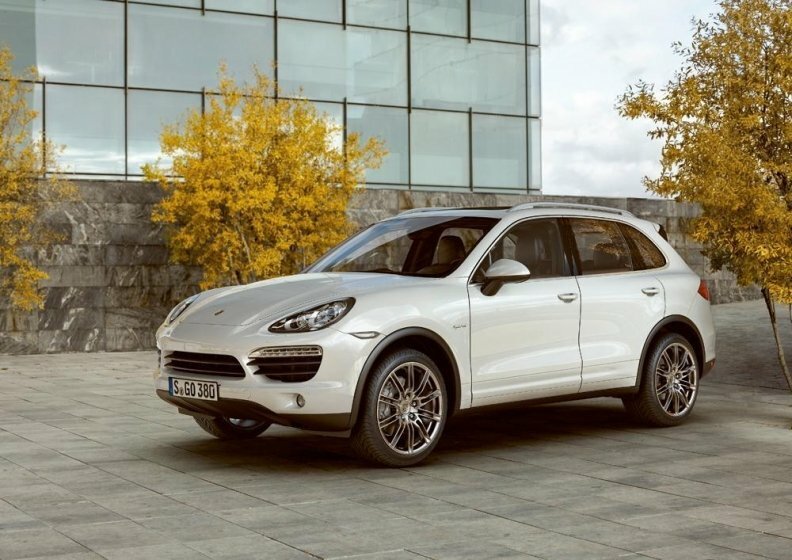 The Cayenne Diesel has a 240 bhp (176 kW) three-litre V6 engine offering 550 Nm of pulling power. In the new car, this powertrain now offers 20 per cent lower fuel consumption, with a Combined mpg of 38.2 (7.4 ltr/100 km), increased from 30.4 mpg (9.3 ltr/100km). Consequently, CO2 emissions are 195 g/km. The maxim of more power on less fuel is demonstrated by the Cayenne S, which now features a 400 hp high-torque 4.8-litre V8 petrol engine. With 15 hp more than the prior model combined with greater economy, this new engine offers significantly better performance overall, just like all models in the new generation of the Cayenne. In particular, fuel consumption is down by 23 per cent, with a Combined mpg of 26.9 (10.5 litres/100km). Greater efficiency is also an attribute of the Cayenne Turbo, with its 500 bhp (368 kW) twin-turbocharged 4.8-litre V8 returning 27.6 mpg Combined (11.5 ltr/100 km) in the New European Driving Cycle. This is once again 23 per cent less than its predecessor. Standard equipment on every Cayenne includes Porsche Traction Management (PTM) all-wheel drive, leather interior, dual-zone automatic climate control, front and rear parking sensors, cruise control, audio system with 7-inch touch-screen, eight-way powered front seat adjustment, 18" alloy wheels, front and rear electric windows, and a 100-litre fuel tank. The Cayenne Turbo adds air suspension with Porsche Active Suspension Management (PASM), Bi-xenon headlights, 19" alloy wheels, tyre pressure monitoring, Porsche Communication Management with satellite navigation, BOSE audio system, heated seats and metallic paint. Fitted to every Cayenne S, S Hybrid and Turbo is a Porsche Vehicle Tracking System (VTS), a sophisticated vehicle security package approved to Thatcham Category 5 standard. Customers will also be able to explore the dynamic attributes of their Cayenne, and further develop their own skills behind the wheel, courtesy of a Driving Experience Programme at the Porsche Experience Centre at Silverstone.